A reminder that residents submissions for the Draft Concept Plans, presented at the recent community forums, are due to be lodged today. Although, as mentioned by Aiden Mullen at the Elsternwick Forum, some leeway will be granted for late submissions. Regardless of whether or not you attended a Forum, GERA urges all residents to lodge a submission either today or early next week. The changes are significant and have far reaching implications for all residents who live in, nearby or frequent these activity centres. Likewise for the “lesser” Neighbourhood/Local Centres which, although yet to be reviewed are more than likely to experience similar expansions and height increases. This could be your last chance to express your views/concerns. *The GERA submission is presented as “food for thought” – residents are free to amend or copy comments should they wish to do so. The Centre Road Bentleigh Group have forwarded us the following letter urging residents to attend this Thursday’s Concept Plan Forum for the Bentleigh Activity Centre. Significant changes are being proposed. Forum details and links to Council documentation are provided in the letter. GERA supports the group and strongly urges residents to attend the Forum to express their views on the proposed changes. The City of Glen Eira is currently planning for Bentleigh’s future and has developed a draft plan that is now out for community consultation. This plan proposes excessive development for Bentleigh and if implemented will have a huge impact on our area and the way that we live. Now’s your last chance to influence this direction. Developments of up to eight storeys on both the east and west sides of the train line. The sale and development of Council owned land (current car parks) for up to eight storeys. An increase in the footprint that can be developed to three storeys (from two storeys). Three storey developments on Centre Road, west of Rose Street and east of Jasper Road, along much of Centre Road that is currently two storeys. In summary, this is a proposal for the further significant over-development of Bentleigh, it is not consistent with ongoing resident feedback and it has not been justified by Council. As this plan will shape the future of Bentleigh, Council needs to hear loud and clear that it is not acceptable. Glen Eira currently has the lowest provision of open space in Melbourne, one of the highest population densities, one of the highest rates of new dwelling developments and more than enough housing supply opportunities for future population needs. Glen Eira is already well and truly pulling its weight in terms of Victorian population growth and will continue to do so into the future with large development areas such as East Village on East Boundary Road in East Bentleigh and the completion of Caulfield Village. Based on the current rate of new developments, Glen Eira is well ahead of the state government new dwelling and population projections for 2031. Of concern, none of these facts have been included into the establishment of the Council’s plan for Bentleigh and there is no justification for the excessive over-development proposed. Enough is enough, we need resident involvement now or the damage of what’s being proposed will be irreparable. 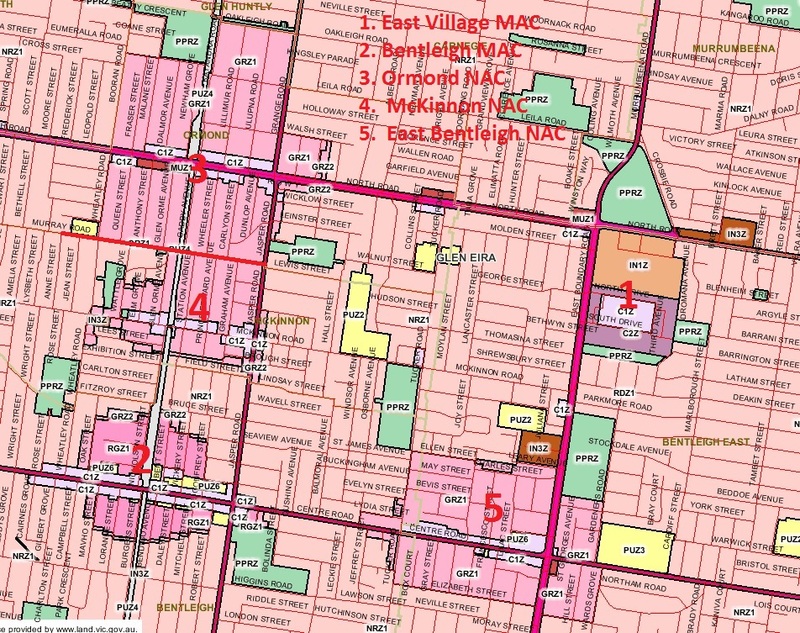 This is what you can do to help shape the right future plan for Bentleigh. Attend the Bentleigh community forum on Thursday 10th August from 6.30pm – 8.30pm at Duncan Mackinnon Reserve Pavilion, corner Murrumbeena and North Roads Murrumbeena. (Please attend, your attendance is very important). Respond to the Online Survey and highlight: four storey developments (maximum), no growth of the zone for new developments, no sale of Council owned land for new developments and the increased provision of open space. Remind them that they have previously stated a position of opposing large-scale and excessive development in Bentleigh and that now’s the opportunity to demonstrate it. In addition to the issues raised in the above letter, GERA believes that when reviewing the proposed changes for Bentleigh, residents should also consider the nearby Major and Neighbourhood Activity Centres. Within the context of a relatively small area, there is significant provision for future development – a significant provision that Council has not considered in the proposed Bentleigh Concept Plan.